Year Of The Renminbi: Is Full Convertibility Around The Corner? As trade denominated in yuan continues to rise at a phenomenal rate, its significance to global markets is quickly increasing. But even as the IMF considers adding renminbi to the basket of SDR reserve currencies and China’s global political clout rises commensurately, the country has yet to fully liberalize its markets—or its currency. 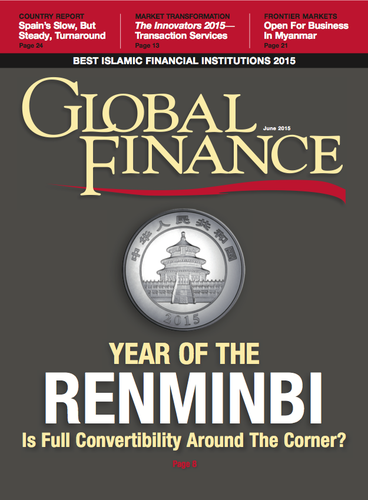 On many fronts, the renminbi’s relevance to global finance is advancing fast. The pace can seem breathtaking. Offshore transactions are on the rise. Companies with substantial sales in China now use renminbi for offshore acquisitions, to manage global supply chain relationships and to pay employees. Shanghai‒Hong Kong Stock Connect—a platform linking the two equity markets—opened late last year. In April regulators allowed mutual funds in China to invest via the program into Hong Kong for the first time, sparking a rally in Asian stock markets. China’s financial infrastructure to connect to Asia is being built, and its funding will be partly renminbi-denominated. Plus, the International Monetary Fund is mulling giving the renminbi reserve currency status. Everywhere you look, the renminbi is gaining traction. But there are still major steps that must be taken by policymakers in Beijing before the currency reaches full convertibility. And when those steps will be taken remains to be seen. The IMF decision on reserve currency status, if positive, will be a crucial milestone in the international development of the currency, giving the renminbi the cachet to sit beside the US dollar and the euro on the global stage. At issue is the inclusion of the renminbi in the Fund’s “special drawing rights” basket. SDRs form the IMF’s virtual currency, created in 1969 to complement existing reserves of member countries. Granting of SDR status would “send a signal to both corporates and the market that liberalization of the currency has come a long way and build confidence in China’s policy on opening of the capital account,” says Evan Goldstein, Hong Kong‒based global head of renminbi solutions at Deutsche Bank. Goldstein, appointed to this newly created position last year, is among a growing number of renminbi gurus at big banks—another sign of the attention that global financial institutions are paying to the currency’s development. HSBC’s Vina Cheung is global head of renminbi internationalization, a Hong Kong‒based job created two years ago. Likewise, Julien Martin heads the renminbi competence center at BNP Paribas, a post created last year. The list goes on. These posts reflect banks’ strategies to consolidate renminbi services into coherent offerings. How fast-moving? Carmen Ling, global head of renminbi solutions, corporate and institutional clients at Standard Chartered, likes to point to the growing amount of renminbi cross-border trades outside of China. Ling cites a recent trade from a European company in offshore renminbi—also known as CNH—paying a supplier in Africa. The African supplier was happy to be paid in yuan (yuan renminbi, the denomination), because it could remit funds to its suppliers back in China. These transactions are becoming the bread-and-butter of global financial institutions. “Banks need to play a role in matchmaking these opportunities,” Ling notes. With internationalization comes responsibility. The acceleration of offshore use of the currency aligns with China’s increasing economic and political clout. The government is seeking inclusion in the SDR basket concurrently with its launch of the Asian Infrastructure Investment Bank (AIIB). The bank, seen as a rival to the US-dominated World Bank, will finance projects like the building of roads, railways and airports. It will be headquartered in Beijing and start with a pot of $50 billion, with a goal of reaching $100 billion. So far, 57 nations have signed on as founding members of the fund with China—the US and Japan are conspicuously absent. The move handily addresses a criticism sometimes lobbed at China’s leaders that the government has not stepped onto the stage of world economic leadership at a pace commensurate with its phenomenal growth. The Washington-based IMF is eyeing AIIB developments from the sidelines. Shaun Roache, the IMF resident representative for Hong Kong, reiterated the IMF’s stance at a Hong Kong conference recently, saying that it expects the new development bank will complement rather than compete with the activities of existing multilateral lenders. If they [the IMF board] think that a review within five years is warranted by changing international monetary arrangements, then that review will be on the table. The AIIB will almost certainly boost the ecosystem of renminbi payments. The creation of the bank is also calculated to edge the IMF toward granting SDR status to the renminbi. When IMF members debate the issue later this year, it will be hard to say no. One reason is that a review of membership to the SDR basket is done only every five years, making the IMF’s decision particularly delicate. Should it refuse admittance now, where will the renminbi be in five year’s time? China is comfortably in place as the world’s second-largest economy, having edged out Japan in 2010. In terms of purchasing power parity, or PPP, a technique used to determine the relative value of currencies, China surpassed the US to become the world’s biggest economy in October 2014, according to the IMF’s reckoning. Although China’s economy is slowing, the government aims to sustain average annual GDP expansion of 7% over the next five years. This will ensure steady growth in cross-border yuan usage.